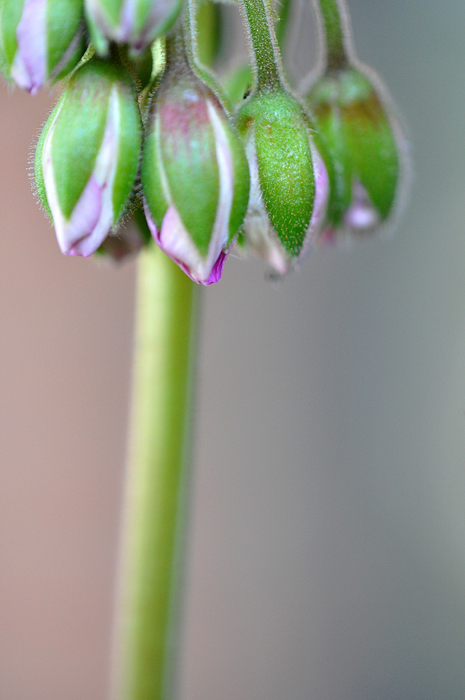 As usual, time was limited today to get my shot, but I kind of liked seeing these geranium buds closeup. I don’t see as well up close anymore – so it’s pretty cool to use the macro lens to see nature a little better. I thought I was buying all red geraniums. Looks like the wrong label was placed in the pot. Oh well. The pink ones are pretty too. We were invited to an evening concert tonight by my sister and brother-in-law. It was great music mixed with frogs croaking and lightning bugs. Ah, Southern summer nights! I love it. Poor Murray. The vet has determined he has a sty on his eyelid that is trying to rupture. 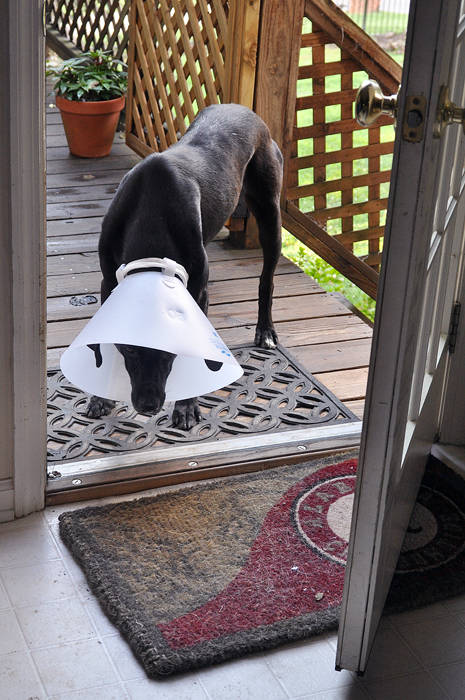 That means antibiotics, pain meds and the dreaded cone of shame. . . so he won’t scratch it and damage his cornea. One week – if all goes well – until freedom. Until then: Deep, Dark Depression. This is what I saw when I was leaving work today. This is an area at the bottom of the back stairwell. 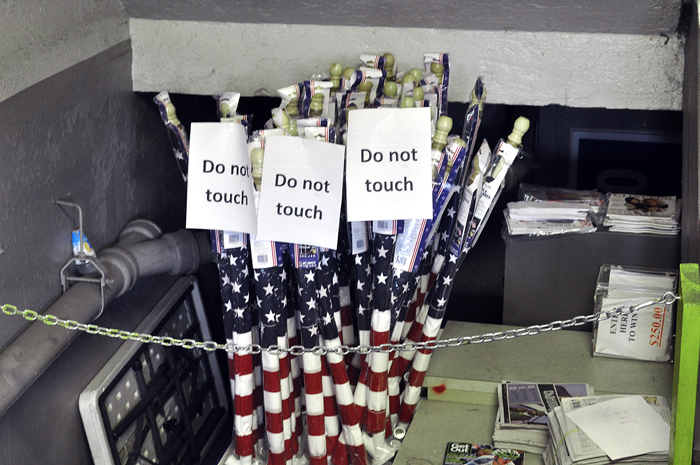 “Subscribe to our paper and receive a flag.” Pretty cool. It’s better than a mug, at least. I like the symbolism even better. I honestly don’t remember what store this window is from. I think it’s Coldwater Creek. 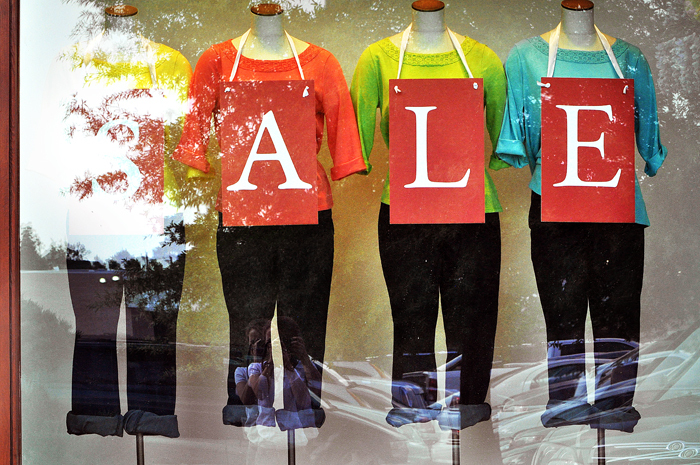 I am fascinated by mannequins in windows. I had a few minutes this evening to shop for some clothes. I need so many things, but rarely have time to look. I cherish those times – for the first 5 minutes. And then I remember – shopping gets on my nerves. Of course, if I had found anything today that fit or was cheap enough for me to purchase, I’d be in a better mood. It’s hard being a girl. This was not my original photo of the day. I had taken that early this morning before I left for work. But after seeing this guy, I could not resist switching out my subjects. 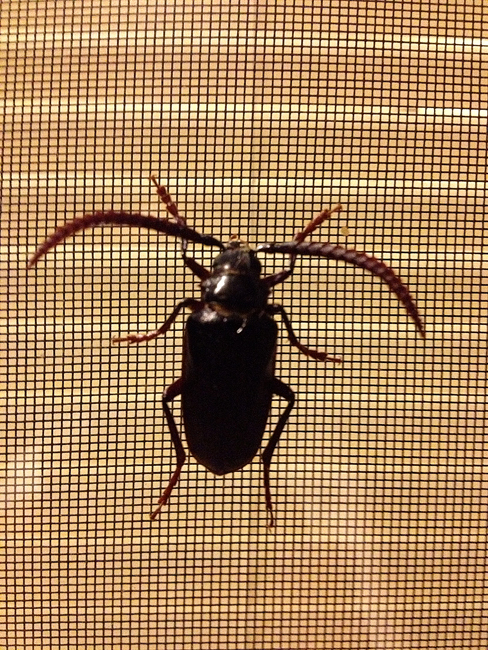 I think this is a Palo Verde beetle. But I am just guessing from the photos I found on the internet. Y’all may know better than I do. Anyway, I thought he was pretty cool. There is a whole new world after dark. Joe and I usually eat lunch with his parents after church every Sunday. But in the summer, we sometimes go back to their house for dinner and a dip in the pool. One of my very favorite things to do is read by the pool. I’m reading Frank McCourt’s third and final book, “Teacher Man,” right now. I love that man, and I got a chance to hear him speak several years ago at the University of Tennessee at Chattanooga (UTC). After it was over, I ran down to the stage to be close to him. He looked down at me with the expression, “Yes?” – but I was speechless. I wish I could have said something profound to him – at least thank him for his wonderful books – but I just smiled and waved. He looked puzzled and waved back at me. Everyone else had intelligent things to say to him. I just waved. What an idiot. 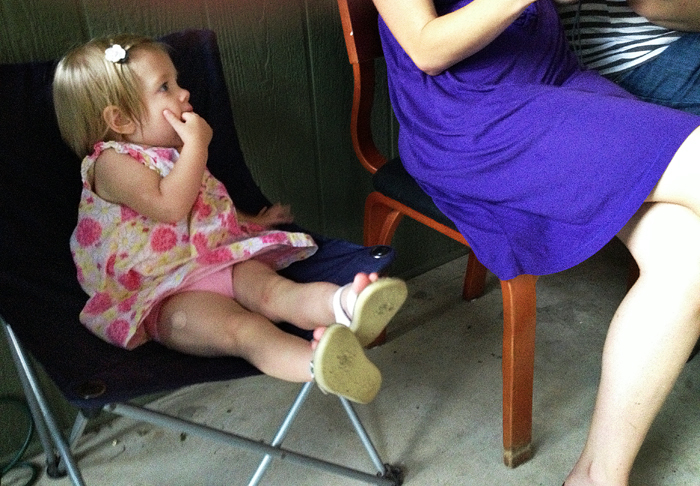 Anyway, this is just a reflection of me in my in-laws’ sliding glass door. I kind of like the tropical look it has. It was tough to focus, however. My reflection was not sharp in the glass; but if I focused on the glass itself, then I would REALLY out of focus. I settled on the best I could do and ended up kind of liking it. It gives the scene a mysterious feel. At least to me. Ok. I must say, getting a sharp photo of this guy was NOT easy. 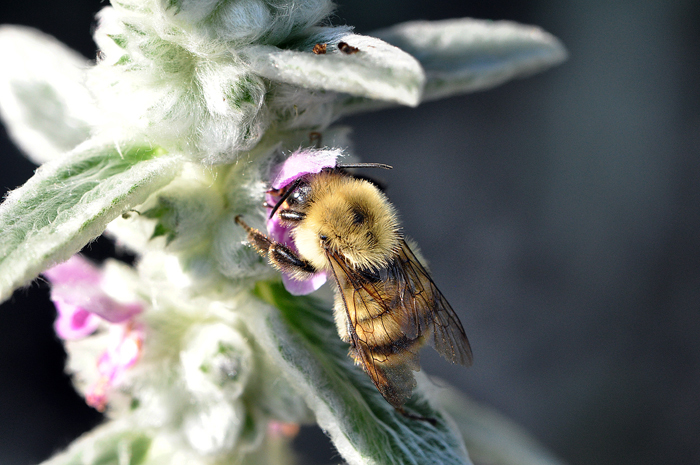 Bumble bees never stop moving. And, as usual, I gave myself only one shot to get it. After this shot, the other bumble bees came after me. Apparently they thought I wanted their pollen. I had to get an early start on my image today because I know I will not have time later. 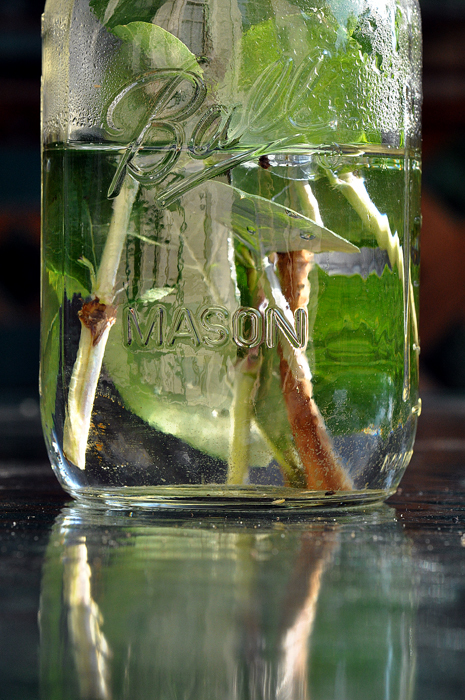 Fortunately for me the light was hitting this mason jar just right. It was given to us a couple of Christmases ago by one of my favorite neighbors. . . full of beautiful cuttings, of course. I had several compositions for this framed up before I took this one, but none really did much for me. And according to my made up rules for this project – One Shot Only. No second chances. In theory it is designed to force me to compose better photos instead of relying on the digital format which allows us to take as many photos as possible without any consequences. That tends to make me complacent and not really pay attention. I grew up on film where every frame essentially cost us money – so we had to make sure the photo was worth taking before we took the picture. What was only going to take a few minutes to do, turned into a big mess. The belt on the riding lawn mower at the house we are renovating slipped off of the pulleys every few minutes. Joe kept having to stop and put it back on. I finally cranked up the push mower to help him finish since it was getting dark – only to discover it is leaking gas. We were only able to cut the front. Two mowers down with the sun. But we got it done for the day. 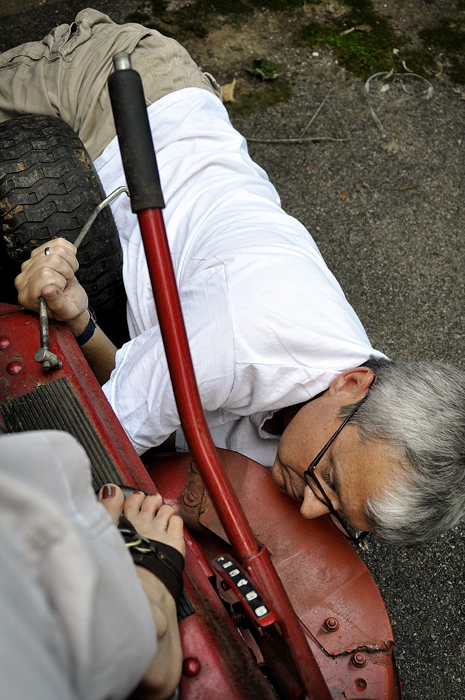 But my Snapshot of the Day ended up being of Joe wedged up under the lawn mower…NOT smiling.